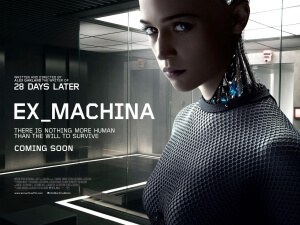 The first directorial feature from writer Alex Garland – whose film work on 28 Days Later and Dredd among others has drawn much praise from critics and filmmakers alike – shares a deep personal connection with its own central figure, humanoid artificial intelligence Ava (Alicia Vikander). As is with her, Ex Machina is sleek, curious, ambitious, and pushing the envelope in what we perceive as technology. The result is something that truly is, to borrow the blunt reaction of protagonist Caleb (Domhnall Gleeson), “f**king amazing”. Garland certainly has a firm grip on the camera, contributing a vision that is both its own style and its own substance. The slow-burner pace allows us to get to know the three main characters, including Oscar Isaac’s unhinged inventor Nathan – or four, if you count Sonoya Mizuno’s mute servant Kyoko as an additional presence – and build the tension between all of them as the time goes by. For instance, Nathan is a total shut-in from society but he still has the strength and stamina to make an impact on rare outsiders, despite his clear alcoholism more than once getting the better of him. However, that doesn’t prevent him from being an intimidating presence for the meek and wide-eyed Caleb, and his insistence that their relationship be more equal than dependent on a hierarchy only serves to emphasise the latter more with his domineering alpha-male attitude and entitled ego, driven by Caleb’s own claim that by creating Ava he is akin to God. Garland uses his key narrative skills well within the limitations of a visual medium, never going too heavy on exposition and just letting the scene play out with his developed characters. Its numerous dialogue-heavy scenes, and confined location with a limited number of speaking characters, compliment a possible theatre production, and it would be interesting to see if – and how – they would be able to pull it off on stage whether the opportunity arises. It would even make a fine story to tell in book form, for you can just see how former novel writer Garland – whose first book The Beach was adapted by Danny Boyle into a Leonardo DiCaprio vehicle – could easily adapt it into his great literary comeback. However, its absolute primal identity is as a feature film, and it manages to use every possible angle it can to tell a fascinating tale in this format – its visual effects, for instance, are stunning in its subtlety; you’re left wondering how on Earth they made Ava’s showing insides look so real, and soon you forget that you’re looking at an effect at all and determine that Vikander really was created by the dude from Inside Llewyn Davis. Isaac and Gleeson – soon to be seen together again in ANOTHER forthcoming 2015 sci-fi flick (some indie called Star…something, we forget.) – may seem to be the two leads, and both do well in their individual parts, but Vikander is the real main attraction here. There’s something about this particular actress that seems best suited to play this type of character, and we don’t mean that in a hurtful way especially seeing how she’s playing a robot; there’s an air about her that seems to truly understand what it is to have independent thought despite her man-made design, and she nails it with an alarming amount of believability. As the film begins to adopt a more feminist persona late into its third act, it’s warranted because it feels as though her Ava is the one character who has the most to gain, whereas the men are only spiralling downwards into arrogance and deviousness, and you’re with her every step of the way because of it. This is the sort of character that deserves to be up there with Ellen Ripley et al as one of the most intriguing sci-fi heroines of recent years, and serves as a positive sign that we may finally be headed towards a more female-centric line of action heroes which Hollywood has sorely been lacking of late.